Welcome, to our September edition. As India has entered in the 65th year of Independence, we look forward to further emphasize our Indian heritage and values. We wish all the very best to our clients, friends and partners around the globe. Energy Focus Reports is a trade portal dedicated to bringing business together in the global oil & gas marketplace. FocusReports.net is filled with an international company directory, “Who‟s Who” executive profiles, and exclusive interviews with leading decision-makers, who share first-hand strategic thinking and insider market information. Focus Report: Advance Valves was formed in 1986, and you are celebrating your 25th anniversary this year. You are a well-recognized Indian industrial champion, and a known global player. Can you give us an overview of the vision and the business model that has held the company together over the years? Mr. Uma Shanker: “Before I started the company 25 years ago, I worked for 10 years at Engineers India, and also at a national oil company in Abu Dhabi. Though my background is that of an EPC engineer, I decided to enter the flow control segment. My initial vision of Advance Valves was to create a business that was different and distinct. When we started in 1986, we started with a product that had not been introduced in India before: balancing valves, which are used in the air conditioning industry. We were the first to introduce that to India, and it is now an essential part of systems. We were able to address that question by offering the technology to clients meeting the highest specs at a cost-effective price. That is why we got recognition globally. We are now approved by most of the EPC companies in Europe—name anybody. …. “We have been growing cumulatively at a pretty rapid clip—we have grown 10 times over, in the last 10 years. Going forward, we are trying to maintain this same level of growth. We are in the top five companies globally in our product line—not in terms of volume, but in terms of capability and range. Focus Report: What are the advantages and challenges of working with local companies versus working with multinationals? Mr. Uma Shanker: “Few years ago, domestic customers were „easier‟—in terms of quality requirements, or technical specifications—and global customers were tougher. Global buyers were more technical; local buyers more price-oriented. We kept the standards the same for everybody, so local customers received high-standard products as well—we did not want our local and global customers to receive different products. Now you do not see this division. Indian buyers are as technologically demanding as global customers. The differences are vanishing more and more. Particularly with the global market—the supplier base, and the vendor base, and the engineering consulting base, are becoming more and more global; and the scale of operation in India is ever growing. …. Focus report: You have personally been recognized for the work you‟ve done in promoting Advance Valves: you have won the Udyog Patra award, given to entrepreneurial industrialists that have changed India‟s industrial landscape. When you look back on what you have achieved with Advance Valves, what are you most proud of? What mark does Advance Valves leave on India? Mr. Uma Shanker: “I am only proud of the fact that we have built the platform from which we may now truly take off. That is it. We have only just arrived. Now we can dare to do what we wish to do, and the next generation will be the one to take it further. I do not think that in my lifetime, I am looking to leave a mark of some kind. We definitely can say that we change the way you think about it—our punch line is “Changing the way you think about valves.” This maxim was introduced around 2001, and was a very aggressive statement; and we have, over time, justified and proven it successfully”…. After manufacturing the 1900mm Valve (published in Newsletter March 2011), we have successfully executed another 2000mm (2m) Butterfly Double Offset valve for an EIL order. We are today capable of delivering valves from 1.5” (40mm) to 120” (3000mm) and the delivery depict here is just another instance of the confidence our clients repose on us. Seen here is the team with the valve ready to be delivered. Exhibition to Watch Out for !! 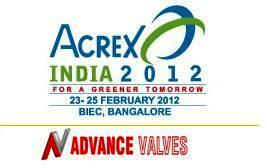 The 13th edition of ACREX India is to be held from 23rd to 25th February 2012 at Bangalore. Advance Valves, as a Silver Sponsor, is proud to be associated with the India’s exhibition for HVAC segment.